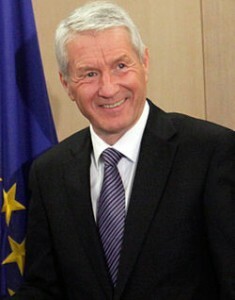 The Secretary General of the Council of Europe came to Lithuania. Apart from discussing with President Dalia Grybauskaitė some matters related to Lithuania’s presidency that comes soon he also criticised a few aspects associated with human rights. He emphasized that Lithuania is a sovereign state and it meets almost all European standards. However, he stressed that in some aspects Lithuania still does not keep up with other European countries. First he mentioned the lack of respect for the rights of minorities. The electoral system in Lithuania also deserves critique. On its basis, borders of a few constituencies were changes and in this way the national minorities’ electorate was broken into small parts. The activity of the General Electoral Commission and votes buying also raises some controversy. The European Foundation for Human Rights has expressed its anxiety caused by lack of an Act on national minorities in Lithuania many times. Since 2011 Lithuania, as the only country in the Council of Europe that ratified the Framework Convention for the Protection of National Minorities, does not have framework regulations that would guarantee national minorities basic protection and rights included in international treaties ratified by Lithuania. The general uneasiness of the people once again confirms the necessity for adopting an act on national minorities as soon as possible. Moreover, the biggest international organisations for democracy and the most famous experts on the protection of human rights say that in Lithuania human rights – most importantly minorities rights- are not respected. Freedom House in its current report says that “(…) the discrimination of ethnical minorities that make up 16% of the population is still a problem, especially for the small Roma population.” http://www.efhr.eu/2013/05/29/freedom-house-zmienia-raport-o-litwie-na-wniosek-efhr/) Professor Fernand de Varennes said that the Framework Convention that was ratified is an integral part of Lithuanian legal system, so there comes just one undisputable conclusion – Lithuanian authorities should respect the laws stated in the Convention . (http://www.efhr.eu/2013/03/31/prof-fernand-de-varennes-z-wizyta-na-litwie/) Last year the Russian Ministry of Foreign Affairs published a Report on respecting the law in the European Union (http://www.efhr.eu/2013/01/14/kolejny-raport-na-temat-praw-czlowieka-krytyczny-wobec-litwy/). The Report discussed such matters as directing the policy to assimilate national and linguistic minorities and limiting their laws. It notices, most importantly, the legislative vacuum in general matters related to national minorities (lack of an act on national minorities since 2011) and the lack of a central organ that would coordinate the government’s politics towards national minorities (the Department of National Minorities and Migration was removed in 2009).